Today is Perfect Picture Book Friday, so stay tuned for a great picture book review and activity AND a chance to vote for your favorite jingle. But first, I want to share something else that is quite special. Guess what! May 13-19 is Children’s Book Week! Helping every child become a reader and lover of books is a goal held by many of us. To help celebrate, Mother Daughter Book Reviews and Youth Literature Reviews are hosting an awesome GIVEAWAY blog hop. Did I say this was an AWESOME blog hop? Dozens and dozens of book-loving bloggers will be participating. You can join by doing a post and giveaway and linking up OR you can visit any or all of the blogs on the link-up and enter for a chance to win each prize! My giveaway will consist of a copy of my book, Show Me How! Build Your Child’s Self-Esteem Through Reading, Crafting and Cooking. This is the book I will be sharing at the 2013 Asian Festival of Children’s Content and, with the end of school approaching, it is a wonderful resource that will provide fun-filled educational self-esteem-building activities that will keep your kids entertained and learning, all summer long! I’ll also include a pad of construction paper, a pair of safety scissors, a glue stick and a package of markers…all you will need in order to do many of the simple projects shown in my book. To top off the prize, I’ll put a brand-new classic picture book in the envelope. Enter to win my prize package (US residents only…sorry…that is because of the cost of postage)! Just leave a comment on this post. If you’d like to follow me on Twitter or be a fan of my Show Me How page on Facebook, please click on the social media buttons near the bottom right of the banner at the top of this page. Head over to Mother Daughter Book Reviews for all the posting/giveaway details…don’t miss this great opportunity to participate by joining the link-up or entering to win the prizes. You’ve been quite patient…here is my Perfect Picture Book Friday review. Publisher: Originally published by Frederick Warne in 1902, The Tale of Peter Rabbit has been republished dozens of times…the latest edition commemorates the 110th anniversary of the book. · A story that has stood the test of time – OVER 100 YEARS and still going strong! · Fellow picture book writers and illustrators will appreciate the fact that this story started out as a letter to the child of a friend of Ms. Potter. Several years later, she was encouraged to turn the letter into a book. She was a woman…at the turn of the last century when most women did not have the rights and opportunities that many have these days…she didn’t have 12×12, PiBoIdMo, SubSix…but she did it anyway! · Wonderful read-aloud…please, please, please read with your child EVERY DAY! A few minutes is all it takes! · Perfect story for a child who has a hard time staying out of trouble. · Shows how important it is to listen to your mother!!!! · Highlights how too much of even a good thing (carrots, lettuce, etc) can be bad for us. Plant carrot, lettuce or other vegetable seeds in containers or in the garden. For more wonderful picture book reviews, please visit children’s author Susanna Leonard Hill where you will find over 1000 categorized picture book reviews…and dozens of new ones every Friday. WAIT…DON’T GO YET! THERE IS A JINGLE CONTEST GOING ON RIGHT NOW! 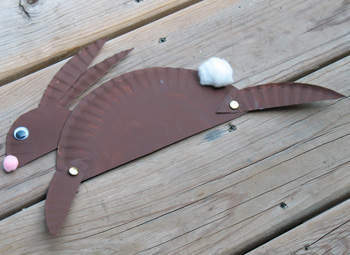 This entry was posted in Children's Book Week Giveaway Hop, Paper plate bunny craft, Perfect Picture Book Friday, Picture Book Review and tagged Beatrix Potter, Children's Book Week Giveaway Hop, Paper Plate Bunny Craft, Perfect Picture Book Friday, Show Me How! Build Your Child's Self-Esteem Through Reading, The Tale of Peter Rabbit book review by viviankirkfield. Bookmark the permalink. I recently read a bunch of Beatrix Potter tales with my kids and they were shocked at the consequences the little ones faced for misbehaving! They laughed at the misadventures and knew when the young ones were getting in trouble by not being too smart, but they thought the adults were mean in the way they handled it. How times have changed (for the better, mostly, I think). Haha, my kids and I loved that Mo Willems book, it was very funny! I hear you about children’s stories being horrific. My mom gave us the little red riding hood in French, the original story, and at the end the girl gets eaten, that’s it. My kids were shocked nobody rescued her or the grandmother. I think Peter Rabbit getting beaten with a stick got the better end of the deal! Wow, we were in sore need of some Beatrix Potter on PPBF! LOVELOVELOVE this book! I can’t believe we haven’t had Beatrix Potter on PPBF – so many good ones, but I really think this is my favorite, because it reminds me of being little and having my mom and grandmother read it to me 🙂 Wonderful activities! Thanks for adding this one to our list! Yay Peter Rabbit! Can;t believe it hadn’t been done already! Love the cover illustration. Beautiful! Thanks Vivian for a lovely review. Peter Rabbit was one of absolute favorites as a kid. My favorite line was “It was a blue jacket with brass buttons, quite new.” My dad often tells us how he would try to skip some pages at bedtime and we would all protest because we knew exactly what came next. I used to read it to my older son when he was very very tiny, because the story was so soothing to me. Another Beatrix Potter favorite of mine is Two Bad Mice where some mice try to live in a doll house. I’m so happy you stopped by, Alicia! What a lovely comment…I appreciate you sharing how much this story meant to you as a child…and even as an adult. How awesome that you read to your son when he was ‘very, very tiny’…the absolutely best habit we can start. 🙂 Are you coming from the Kid Lit Blog Hop? I need to visit all the other blogs…will try to do that today. I do love this book. Flopsy, Mopsy, Cottontail and Peter should be household names. Thanks for the sweet memory, Vivian! I loved the story of Peter Rabbit as a child. Yes, thanks for a walk down memory lane. Love Beatrix Potter. Great choice. These books are amazing. I’m glad you are recommending them for a whole new generation. Our Little Princesses are just discovering Peter Rabbit! It is such a treat! Thanks for sharing! Wow! Such great ideas. Thanks for sharing. So happy you stopped by. Glad you enjoyed the Peter Rabbit review and the activity ideas. I love teaming a picture book story with a simple craft. What an awesome giveaway! Thank you so much for the opportunity to win it. I haven’t thought about Peter Rabbit for a long time! Thishas inspired me to get it out and share it with the kids! We may even do some of the fun crafts!! Thanks so much for the thoughtful comment…glad my Peter Rabbit review has inspired you to read it with the kids. 🙂 I’m excited to participate in the Children’s Book Week Giveaway Hop…I’ll try to get over to visit every on the list! This books sounds great! I really do believe those things can build self esteem! Sorry you missed the cut-off for the hop, Ann. But I’m so happy you stopped by here…and I’m thrilled you gave me your url…what a super blog you have…and I LOVE the book you are giving away. Native American Indian history should be a required subject in the schools here…perhaps kids would have a better appreciation and understanding of the importance of the nature and the negative impact that humans make on it. I remember Peter Rabbit as a child. Very cute paper plate craft too. What a wonderful giveaway! Love your post and new blog name. The bunny is adorable! Thanks, Susan! Glad you like the new name and look. I think it speaks more to what I am about. 🙂 Your giveaway is pretty fantastic! The Show Me How book looks really fun to not only teach the kids but also give them quality time with their parents as well working together. Thanks for the chance to win! Thanks for ‘hopping’ by, Gretta. The book is the one I wish I’d had when I was teaching kindergarten and when my own children’s were growing up…it definitely makes planning quality time and fun time easier for mom! Good luck in the giveaway! what an awesome giveaway! this would be great for my boys! i like to keep them thinking over the summer so that hopefully they don’t lose what they learned throughout the school year too much! thank you! These are lovely ideas and a great review, but I’m in the UK, so just wanted to wish you luck with your book and giveaway! I agree with you re postage. I had to restrict my paperback to Europe this time – but the ebooks in my giveaway are open internationally. I really must get into Skype! Just realized I had already visited your giveaway post, Jemima! Thanks for the great giveaway…the books look amazing! Hi Tina…thanks for stopping by and entering the giveaway! Best of luck! Great Giveaway! I’m in Canada, so I can’t enter, but I’m happy to tweet about it. Thanks for joining us in the Kid Lit Giveaway Hop! Be sure to check out our Kid Lit Question of the Day. This week we are talking about the category of books, YA. It was a great hop, Renee…thanks for hosting it. I’m only sorry I wasn’t able to get over to all of the wonderful bloggers who participated…I’ve been busy getting ready for my trip to Singapore. This sounds like an awesome resource! I’d love to be entered! Thanks!